Rockwell Automation (NYSE:ROK) recently reported adjusted earnings that advanced 7% over the fiscal third quarter a year ago. That's good, but the top line was down and the company is facing a few headwinds. Management's OK with this and here's that story behind that. During the fiscal third quarter conference call, Rockwell CEO Keith Nosbusch told investors, "I'm pleased with our performance in the quarter as we delivered another quarter of solid earnings growth, despite a year-over-year decline in sales due to a large currency headwind." With earnings up in the high single digits, driven by expanding margins and the repurchase of nearly a million common shares, it's hard to complain too much about the bottom line. That said, the top line is another issue. The headline number showed a decline of around 4.5%. But currency fluctuations took about 6.8% out of sales, meaning organic sales were up around 2.2%. That's a much better number, even though currency is a real issue for a globally diversified player like Rockwell. So Nosbusch is right to be pleased and to point out that even the headline negative wasn't as bad as it at first appears. But, the issue of doing business around the world is part of the company's plan. According to the CEO, "Our revenue diversification efforts, whether from a geographic or vertical perspective, are yielding results." So while the U.S. market accounts for around 55% of the company's top line, the remaining 45% comes from foreign markets and that's likely to continue to grow. So currency will always be an issue — and it will wax and wane over time. The big picture benefit is that growth in some regions will offset weakness in others. For example, through the first three quarters of Rockwell's fiscal year, South America has been the fastest growing region with sales advancing 10%. Other regions have grown in the low single digits with Canada falling 4%. But the overall result was a solid 2.3% sales gain, year over year. That's how diversification is supposed to work. And it's happening on a more granular level, too. For example, the oil and gas industry is a big one for Rockwell and it's suffering mightily. But that didn't derail the automation expert because it's been expanding its reach in other areas. Although diversification won't always look uniformly good, Nosbusch wants you to know these efforts are doing exactly what they are intended to. With that as a backdrop, the CEO went on to explain that, "Global GDP and industrial production growth forecasts have softened since April." In other words, the world isn't doing as well as hoped and that will continue to put pressure on Rockwell's business. For example, the United States and Mexico are generally doing well, with automotive and consumer businesses running strong. However, oil and gas in the U.S. market continues to be a notable laggard and several South American countries are in recession, a clear drag on the company's overall business. Rockwell's Europe, Middle East, and Africa region has remained solid, with life sciences taking the lead. And in Asia, the paths of the two regional giants are diverging; India has seen solid growth and China has been slowing. Mixed is the right way to describe Rockwell's world today. Given that quick backdrop, the CEO went on to explain, "... the outlook for industrial production has weakened and our third quarter organic sales performance came in somewhat below our expectations. While sequential growth will continue in Q4, we no longer expect higher year-over-year growth in the second half ..."
Rockwell still expects the top line to come in at around $6.4 billion, which is down slightly from the prior year. However, it narrowed its earnings guidance from $6.50 to $6.80 a share to $6.55 to $6.70 a share. Note the large change on the high end, suggesting that there's less opportunity for growth right now. Which helps explain why the shares have fallen around 6.5% since June and squares well with the company's global backdrop. But one quarter's performance, or even one whole year's number, doesn't make a company. Which is why CEO Nosbusch summed things up this way: "While the market conditions may not be ideal, I like our competitive position." And he should. Rockwell is a leader in the automation business, essentially making it possible for companies to do more with less. That's a business that can do well even during hard times, as its customers look for ways to cut costs. And, more important, Rockwell has a differentiated offering that works with systems from competitors. Called Logix, this backbone product allows customers to upgrade without replacing all of their machines and equipment. That reduces risk and cost for customers, while allowing Rockwell to get its foot in the door of its competitors' partners. 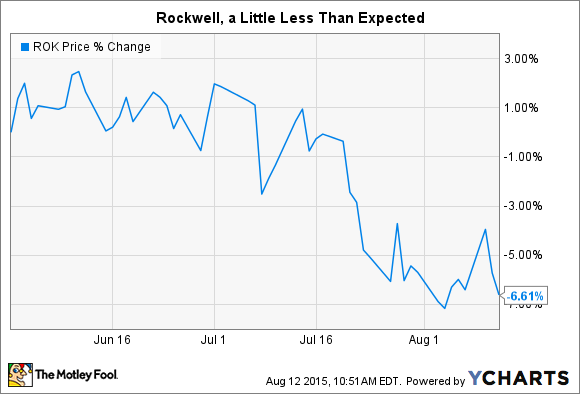 In other words, the CEO is right, there really is a lot to like about Rockwell's business. That's important to keep in mind while Rockwell deals with a softening market environment. Even if it is well positioned, it can't avoid a broad slowdown. Results may not be as good as originally expected this year, but despite the increasing headwinds Rockwell is holding up pretty well overall. Which means the current soft spot could turn into a long-term buying opportunity for growth oriented investors.